Sahara Force India missed out on points at the Circuit of The Americas as Paul Di Resta finished in P16 following a two-stop strategy. Adrian Sutil was out of luck and retired on lap one after contact with Pastor Maldonado. Paul Di Resta: "I made a good start and was in reasonable shape for the first stint. But it soon became clear that we were struggling for pace and not really in the zone with the tyres. We were pushing to do a one-stop race, but the tyre wear was a bit higher than expected and I ran out of tyre performance with nine laps to go. It was hard to defend my position so I had to make a second pit stop. It's a shame because we were quite optimistic before the race and we thought the warmer weather might play into our hands. So it's a bit disappointing, but we will pick ourselves up and look to end the season with a better result in Brazil next weekend." 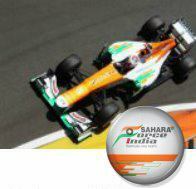 Adrian Sutil: "It feels like I ran out of luck this weekend. Up until Saturday morning I was looking competitive and was happy with the car, but all of that promise disappeared with the problems we had in qualifying. In the race I made a good start, gained a few positions and was racing ahead of Maldonado on the back straight. For some reason he hit my left rear wheel and I immediately lost control of the car and crashed into the barriers. I don't really understand why he was so close to me because the track is so wide there. I stayed on my line and there was a lot of space to the right and the left. So it was an early finish and a very disappointing day." Dr Vijay Mallya, Team Principal and Managing Director: "Despite the promise we have shown at various points during the weekend, we leave the United States without the results we thought were possible. Our chances took a big hit on lap one with the accident for Adrian, which was a result of the contact with Maldonado. That put all our hopes onto Paul and we were looking to repeat the strategy we pulled off in Abu Dhabi by stopping only once. For a while we thought it was possible, but we couldn't achieve the tyre management we needed and had to pull him in for a late second stop. It was always going to be tough to score points today, but I'm optimistic that Interlagos next week will work more in our favour."